In the movie “Welcome to Monster High,” the students of Monster High™ unite to revel in the opening of the high school at the Dance the Fright Away™ celebration. Beasties Draculaura™ and Frankie Stein™ dolls have worked hard for this day and plan to commemorate the skelebration. The ghouls are ready to hop into the photo boo-th with clawesome accessories for freaky fabulous party snapshots! 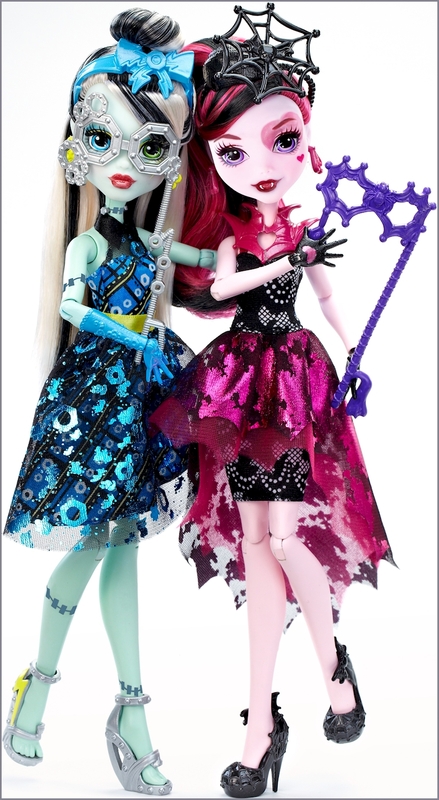 The two original Monster High™ character dolls wear monster-cute party dresses with metallic details, fancy shimmer and glam ghoul makeup. Three photo boo-th accessories for each encourage lots of photo ops. Draculaura™ doll, daughter of Dracula, is to-die-for in her signature pink and black with a metallic shoulder piece and bat print, dramatic collar necklace, spider web-themed hairpiece and bat-detailed black shoes. Heart-shaped makeup and three props that include a Skullette™-inspired piece, spider web-detailed eyeglasses and a Monster High™ burst are fangtastic photo accessories. Frankie Stein™ doll, daughter of Frankenstein, is voltageous in her signature plaid with lightning bright metallic accents, golden earrings and silvery bolt-detailed heels. She’s ready for some electrifying pics with lightning-themed makeup and three photo accessories that include a Skullette™-inspired piece, lightning bolt and nuts-and-bolts decorated eyeglasses. Recreate favorite scenes, make up new moves for the dance floor or tell new monster tales with these favorite Monster High™ characters.